At Heritage Cabin Rentals, we make it easy for large groups to visit the Smoky Mountains together! Our Pigeon Forge cabins with pool tables range from 1-9 bedrooms and can accommodate as many as 30 people. You will all be able to stay in one place and can split the total cost to make it more affordable! You can challenge each other to a couple games of pool while you enjoy each other’s company. Gather your friends and family and treat yourselves to an amazing vacation in the Smoky Mountains! The best part about our Pigeon Forge cabins is that they’re all in a convenient location. You’ll have the privacy of being surrounded by nothing but the mountains, but you also won’t be far from town if you want to go explore everything the area has to offer. Some of our cabins are just minutes from outlet shopping, downtown Pigeon Forge attractions, Dollywood and the Great Smoky Mountains National Park! You can shop for the perfect souvenir to take back home, take pictures with your favorite celebrities at the Hollywood Wax Museum, get an adrenaline rush on thrill rides at Dollywood or go for a hike to see the wildflowers in the National Park! There will be plenty to do just minutes away from where you’re staying. Our Pigeon Forge cabins with pool tables are great for spring break because you’ll have a fun activity to enjoy without having to leave the cabin! In addition to pool tables, you will have a variety of other amenities to take advantage of during your stay. Some of our cabins even have foosball tables and arcade games for you to play! 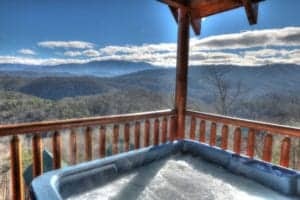 You can soak in the private outdoor hot tub as you stare at breathtaking mountain views, watch a movie on the flat-screen TVs, cook a delicious dinner in the fully equipped kitchen or curl up in front of the fire with a good book to relax. There are also outdoor grills in case you want to have a barbeque with your friends and family! You’ll have everything you need and more for an entertaining spring vacation. To make your vacation more affordable, we offer specials on our cabins for our guests. You will be able to save money on a place to stay so you have more to use on all the attractions in the area! Our specials include things like a free night or a discount on your stay. Browse all our current specials before you book your trip to make sure you get the best deal on your cabin! You won’t even have to leave your cabin to have a good time when you have a pool table and all the other fantastic amenities we offer. Browse all our Pigeon Forge cabins with pool tables and start planning your spring break trip!